Both great advances and "Bambi on the ice"! Data modeling and databases evolved together, and their history dates back to the 1960’s. •	The first wave consisted of network, hierarchical, inverted list, and (in the 1990’s) object-oriented DBMSs; it took place from roughly 1960 to 1999. •	The relational wave introduced all of the SQL products (and a few non-SQL) around 1990 and began to lose users around 2008. •	The decision support wave introduced Online Analytical Processing (OLAP) and specialized DBMSs around 1990, and is still in full force today. 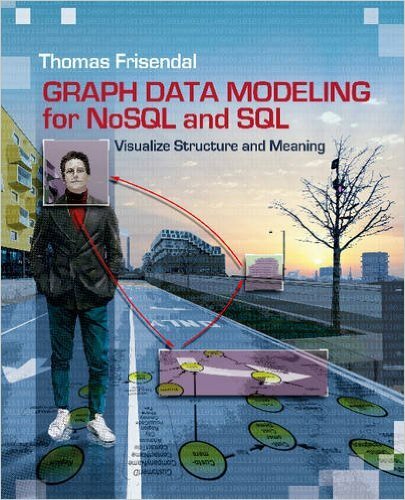 •	The NoSQL wave includes big data, graphs, and much more; it began in 2008. In hindsight, it is observed that data modeling was invented “on the fly.” The results were diverse and sometimes counter-productive to one another. Now, however, pragmatism has come to the rescue; there seems to be a great opportunity to solidify the best methods of modeling data. Let us look back at the history of database in a slightly different manner. 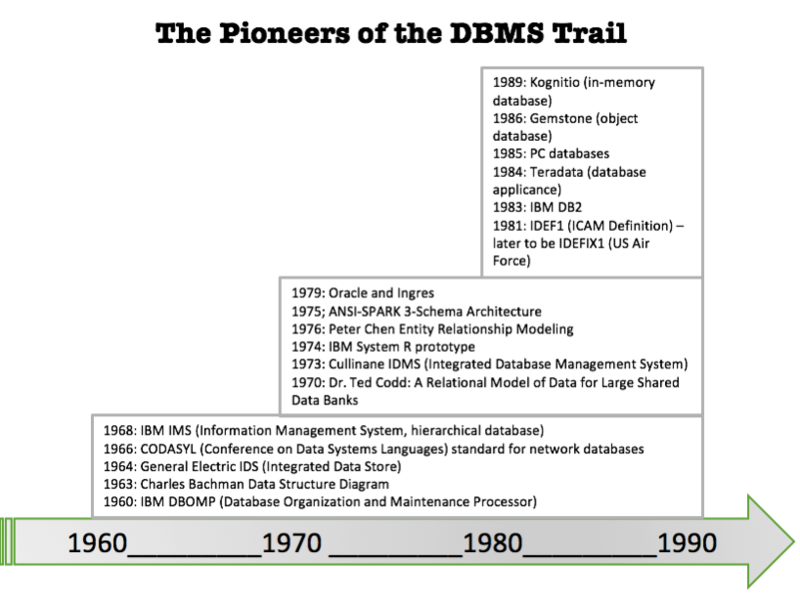 There was a lot of ground to cover for the pioneers of Database Management Systems, and they have done a fine job. The first twenty to twenty-five years introduced and fine-tuned important technological fundamentals. Recently a mathematical incompleteness claim has come from a company called Algebraix Data. They claim that the relational model as defined by Dr. Codd is not really a consistent model since it cannot support sets of sets. •	Other criticisms accused SQL of not being a “well-formed” and complete (in the mathematical sense) computer language. What really turned relational DBMSs into reliable, performant, scalable production tools was the advent of robust query optimizers. In 1979, Patricia Selinger of the IBM research center in San Jose described the optimizer of the IBM System R (a relational prototype system). Optimizer technologies matured during the 1980’s and established the “relational empire” around 1990. 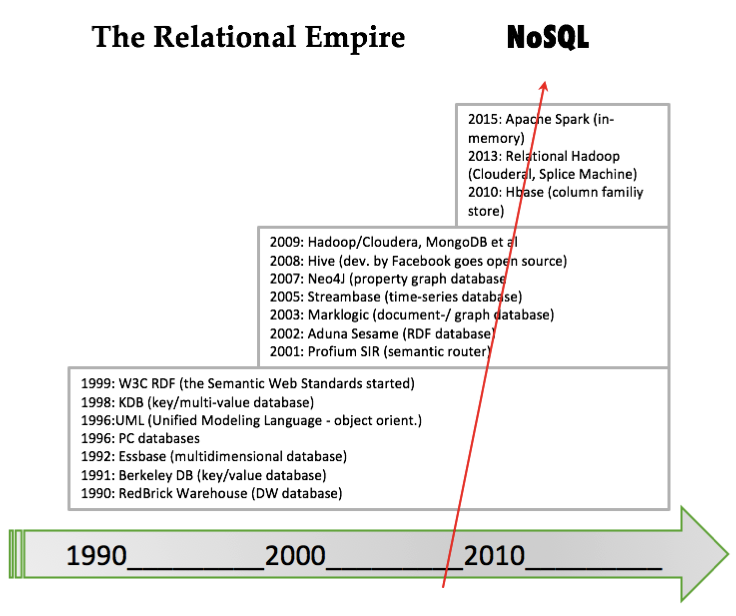 1990 is the start of the “relational empire” because by then, the costbased query optimizers had reached sufficient sophistication to allow the RDBMS products to take over most of the database processing across most industries. Not much new relational technology was published through the 1990’s and early 2000’s. In fact, entrepreneurs (in California, mostly) were busy developing alternatives to the relational approach. Quite a few of the new companies and products were focused on specialized niches such as documents, graphs, semantics, and high-volume applications. Around 2008, triggered by Facebook’s open source versions of Hive and Cassandra, the NoSQL counter-revolution started. This space gets all of the attention today. So, where do we go now? How to balance the “what” and the “how” in light of NoSQL and all of the new technologies? Well, the modern development platforms use schema-free or semi-structured approaches (also under the umbrella of NoSQL). “Model as you go” is a common theme, while data modelers and data governors are seen as relics from the past. Surveys (e.g. Insights into Modeling NoSQL, A Dataversity Report 2015, by Dr. Vladimir Bacvanski and Charles Roe) confirm this. Modeling for NoSQL is very often performed by the developer on the fly. Database veteran David McGoveran notes this important distinction: the IT programmer’s perspective is that of rapid solution delivery, whereas the data modeler’s perspective is that of working with a long term asset (http://bit.ly/29PpWIJ). How then can we choose what to carry over from the data modeling legacy, if anything at all? The answer is found in the Graph Data Modeling Book. If you design GraphQL API's, check this out: Visual Design of GraphQL Data.